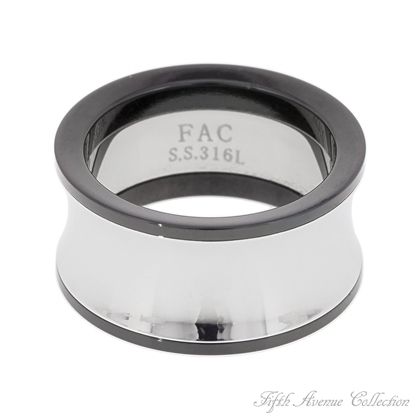 You'll be wowed by this handsome stainless steel ring trimmed with black. Nickel and lead free. 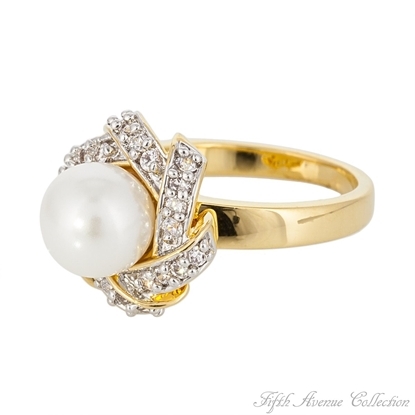 A shimmering sphere of a creamy pearl sits proudly between six tiny triple A quality clear cubic zirconia. Its subtle statement exudes class. 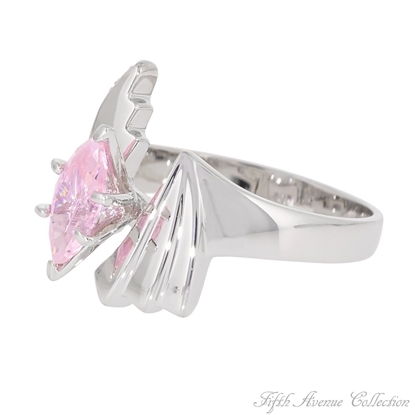 Experience the total feeling of luxury with this bold yet very feminine design. 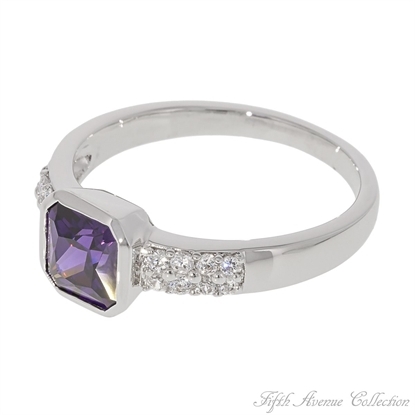 A perfect square cut triple A quality amethyst cubic zirconia dazzles with intoxicating brilliance. Set in a rich and durable rhodium finish, this magnificent coloured stone is shouldered by 16 brilliant whites. 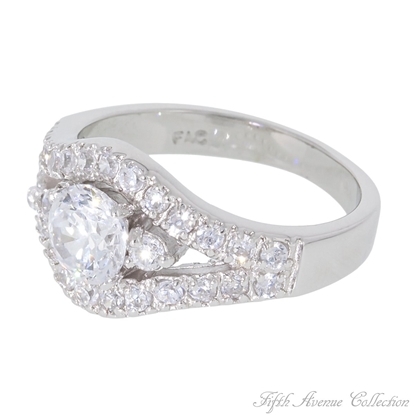 If simplicity is your style, with just a touch of glamour, then this beauty is “Right On” for you! 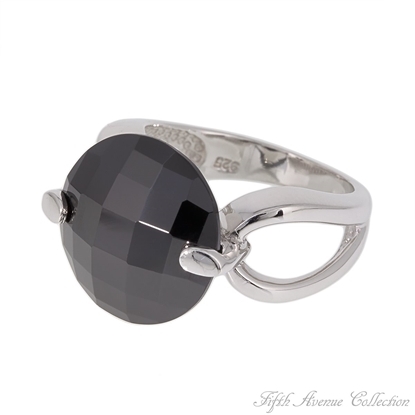 A stunning round ebony or olivine AAA cubic zirconia is the crowning glory of this chic sterling silver mounting, finished in rich rhodium. Sizes 5-12Nickel and lead free. 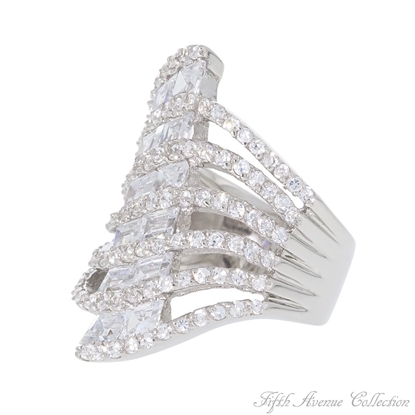 The swanky lady wearing this dazzler is ready to take the runway to a new high! 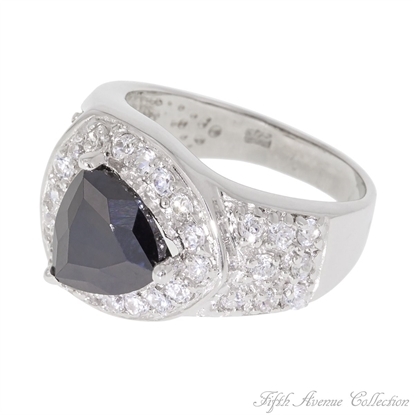 This bold and flashy ring set in sterling silver with a radiant rhodium finish is complete with an enticing jet black triple A quality cubic zirconia set amongst a dashing design of 35 ravishing clears. Become a figure in fashion and dazzle the masterminds of the industry wearing a bit of “Ritz N Glitz”. Shivers of excitement will run up your arm each time you slip on this “Rockin’ Red” ring. 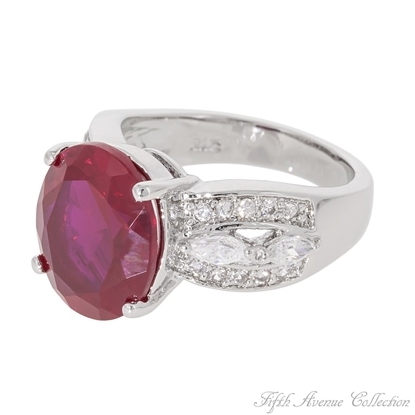 A rich rhodium finish sprinkled with blazing clear cubic zirconia to showcase a magnificent princess cut ruby red triple A quality cubic zirconia. 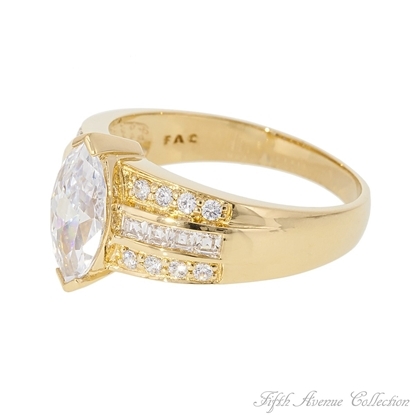 Enhance your style with an esteemed design of world class quality. 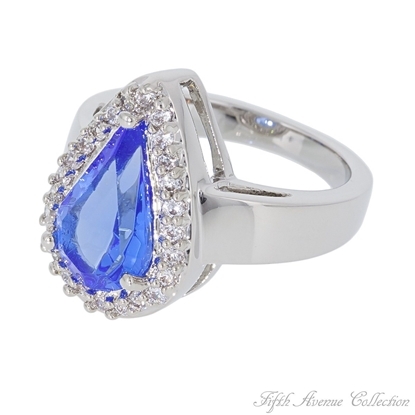 Six sparkling triple A quality clear cubic zirconia accent one large princess cut cubic, in a splendid sapphire blue colour. 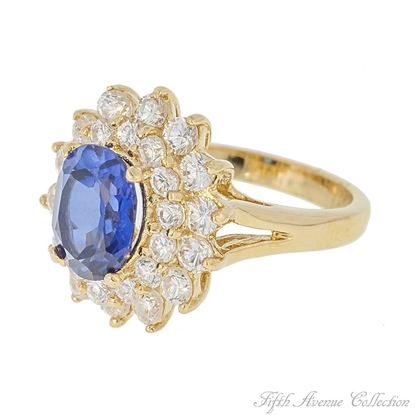 "Sapphire Splendor" finished in rich rhodium, combines fashion and elegance for those who demand the finest. 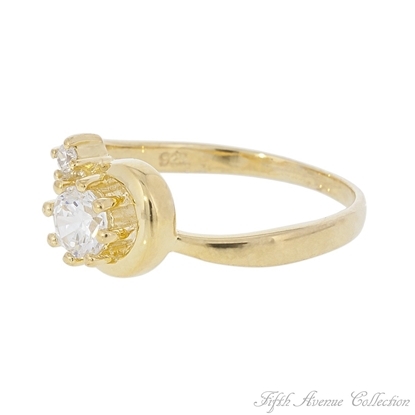 Here is a ring so lovely it will remind you of an old fashioned love song. 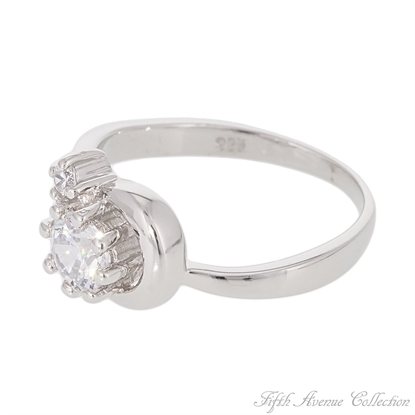 A single AAA quality cubic zirconia shouldered with two smaller stones is brilliant set between two rows of sparkling rounds… “Simply Wonderful.”!Sizes 5-10.Nickel and lead free. 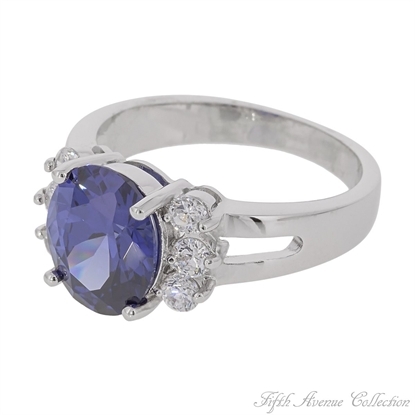 The sapphire… symbolic of royalty, admired for its mysterious beauty, and sought after for its ability to bring out one’s most tantalizing desires.Fifth Avenue Collection presents the rich, deep hues of the brilliant colour found in this triple A quality cubic zirconia. The classic tear drop setting is polished to perfection in a radiant rhodium finish and encrusted with a bounty of fiery clears. Fulfill your desires with “Sky Blue”.Sizes 5–12. 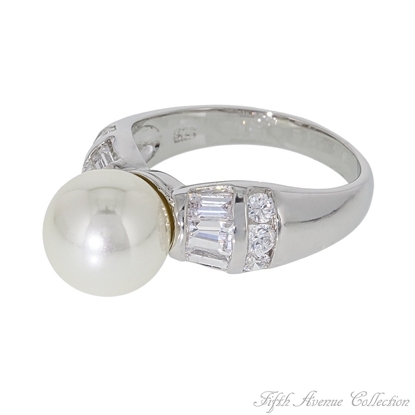 As beautiful as its name, this luminous “Snow White” pearl is beauty in motion as it’s swept away in an elegant sterling silver design, finished in rich rhodium.Lead and nickel free. 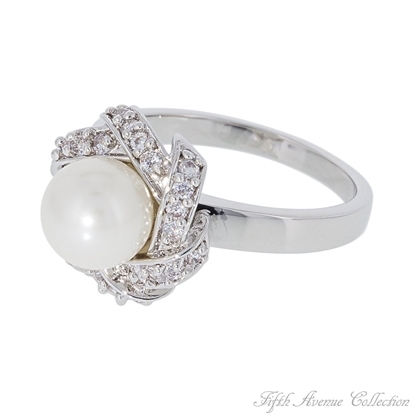 For pure romance nothing compels like the luminous beauty of pearls. 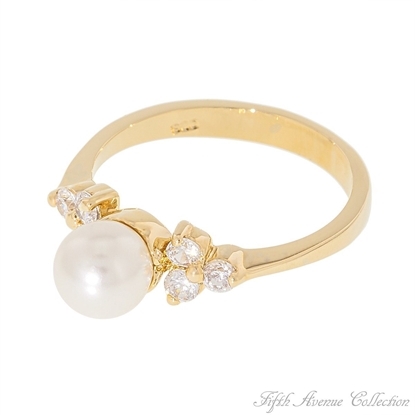 The touch of a million moon beams shines on this heavenly ring set, with a creamy pearl surrounded by dazzling clear cubic zirconia. 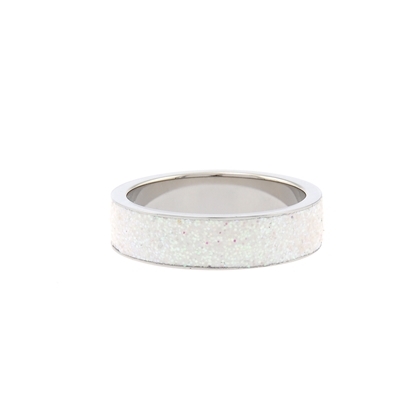 Stack on the style with this edgy trio of high-end, stainless steel rings! 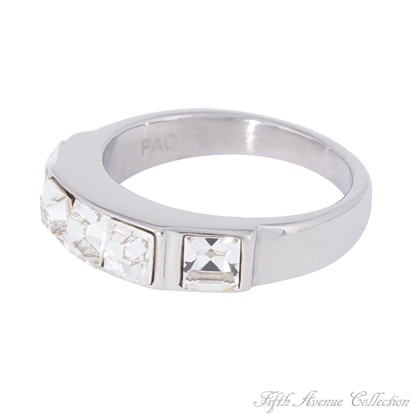 Each ring dazzles with five alluring cubic zirconia, and a band that rocks its angular, diamond cutout design. A perfect pairing of modernity and glamour, this accessory will never go out of style, promising to be one of your fashion favourites that will stand the test of time. 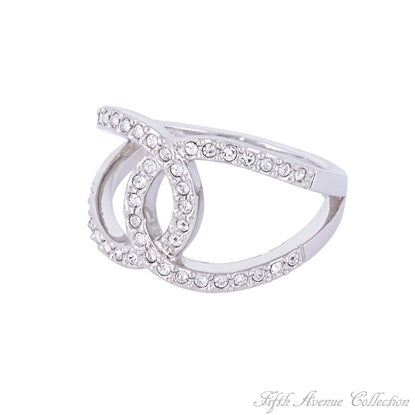 Whether you are classic or elegant or bold and beautiful, you will be caught in the breathtaking waves of swirling AAA quality cubic zirconia clears that cascade around dozens more sparkling square cuts. 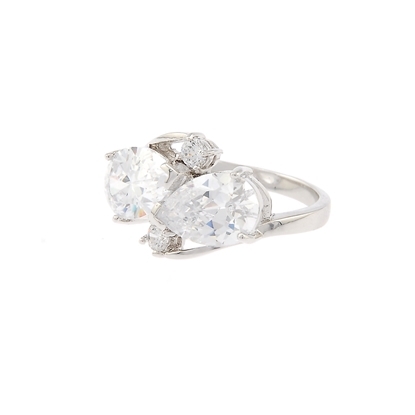 This magnificent sterling silver ring finished in rich rhodium is an absolute must for the woman who adores beautiful jewellery! 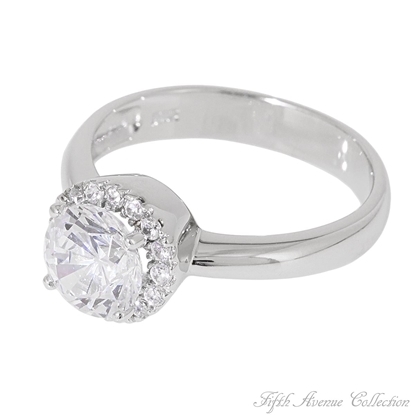 For just a hint of tasteful glamour, choose Fifth Avenue Collection’s “Sweet Sparkle” ring. 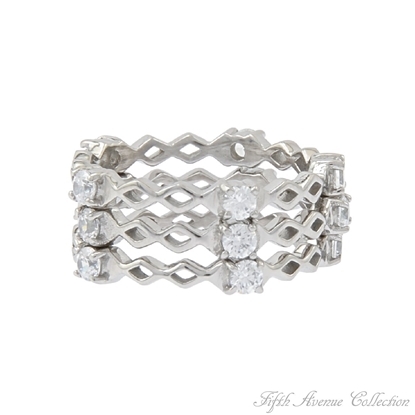 Simple, clean lines of sterling silver and lustrous cubic zirconia gracefully entwine for sweet style that will add the perfect amount of sparkle to your look. "That's Rich! 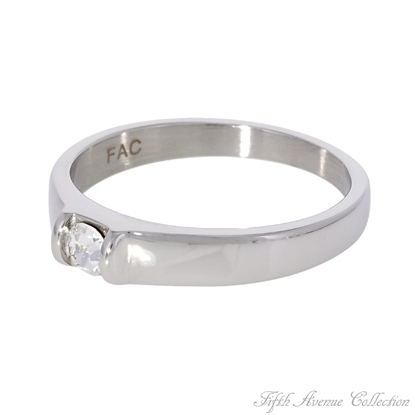 "… and it is so when you wear this stunning AAA cubic zirconia, the crowning glory of this lovely stainless steel ring.Nickel and lead free. Pink champagne on ice. Is there anything that gives a more delicious romantic feeling? 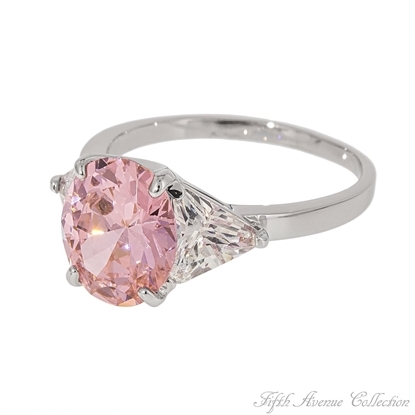 Nothing... unless it’s Fifth Avenue Collection’s "Tickled Pink" jewellery.A delicate ring in tender pink and clear cubic zirconia so brilliant, so hard, so beautiful, it makes you forget about diamonds. 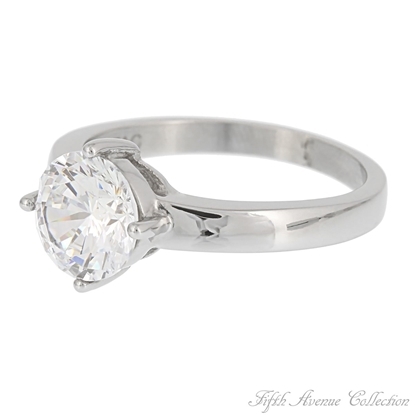 There’s something affectionately timeless about this dazzling sterling silver ring… maybe it’s the unique depth and everlasting brilliance of the center marquis cut AAA cubic zirconia. Or the ageless setting… a wide band featuring two rows of clear rounds and a center row of baguettes, designed to accent the center stone in every light. 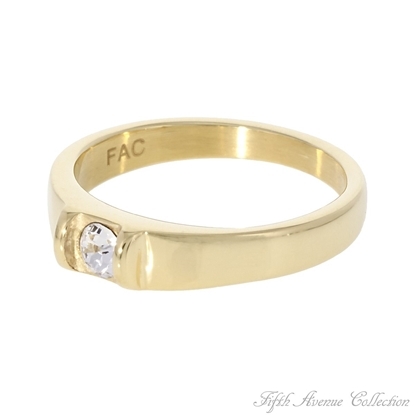 Finished in your choice of rich rhodium or gleaming gold, this ring is a true “Timeless Beauty”.Lead and nickel free. 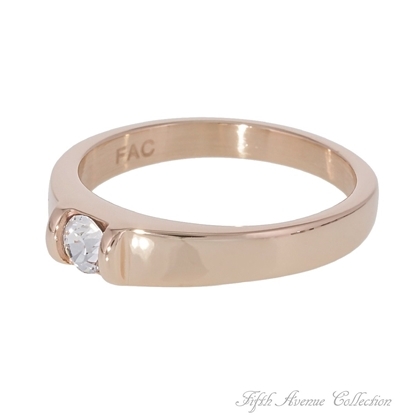 If modern classic is your style you are going to love this wide band and simple design featuring a subtle crown of brilliant AAA quality cubic zirconia. 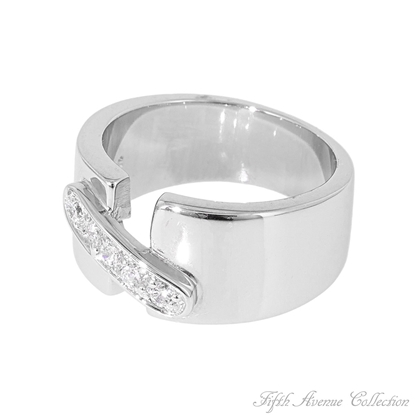 Designed for the woman who knows that simple is always most.Sizes 5-10.Nickel and lead free. A gorgeous AAA trillion cut cubic zirconia trimmed with dozens of sparkling clears will fairly take your breath away with its beauty. 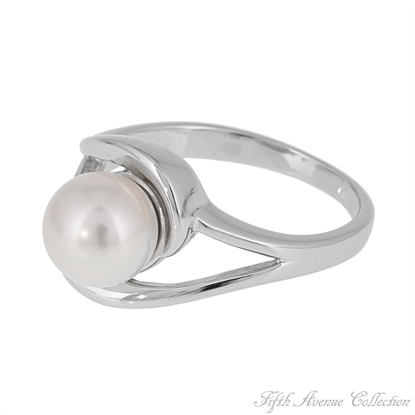 Its smooth sterling silver shank, finished in your choice of gleaming gold or rich rhodium, is stunning in its simplicity.Sizes 5-12Nickel and lead free.